And only today I told someone, I can forget but not forgive. The person on the other side instantly pointed out that I was lying. It took me surprise. Because very few people are able to catch me lying, it is a scorpio’s best asset. And in this small world of blogging where I am hoping he cannot read, I accept. I can not forget and yes cannot forgive, more on that later. Moving on, so yes I remember every minute detail about my life. It is a curse in many ways but yes when the time came that a certain someone called Shilpa Garg tagged me to write about my own “Earliest memory” I got excited. Terribly excited. It was a typical case of problem of plenty. I remember every minute detail of my life. Bloody hell as strange as it may sound I remember the first time I spoke the words ma and the look on my mother’s face. It is very unreal but true. Now what is my earliest memory? My earliest memory is that I was (and am) very very camera friendly. If I started to cry my parents would get the camera out and only pretend to click me, BAM I would stop crying. My earliest memory related to getting clicked is finding out that a certain expression on my face makes me look very cute in pictures. This came after some permutations and combinations. But once perfected I used it for years. Want to know which one? See below! This is as far as it is about me. What I am , what I will be and what I want to be is divided equally between the awesome twosome who brought me to this world. Their love story inspires me to believe in love, their passion to do something beyond the usual has always instilled in me the courage to follow my own dreams and their belief in their kids and their choices tells me I might be worth something someday. I will not let this wonderful chain break with me! I will tag my very own sweet, lovable amazingly cute friend Meena Menon to write her “earliest memory”. Looking forward to it most happily. “What I am , what I will be and what I want to be is divided equally between the awesome twosome who brought me to this world.” So true! Might quote you on this one! What a fab collage! I can see you enjoyed being photographed! 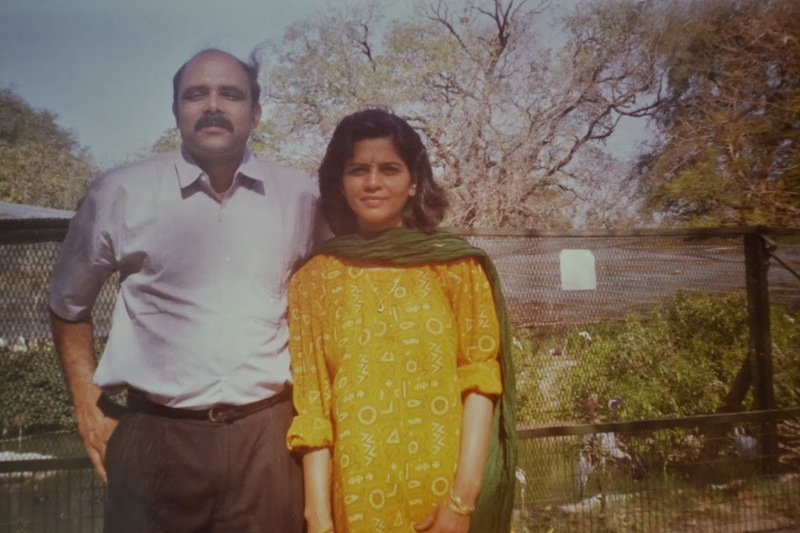 And yes, that frame with your Mom and Dad is beautiful! 🙂 I have an elephant’s memory too – and I forgive, but do not forget. 😀 It is good for my health. hope to follow suit Vidya 🙂 and thanks a lot, yes I lurvee being photographed! hahaha it is a curse trust me..
How amazing to have such a sharp memory. I have a really poor one. Your mom is so pretty. Thanks for sharing. You are so cute!! Oh that expression 🙂 lovely walk down the memory lane with that collage! Yes Aditi, it was a lovely walk down the memory lane for me as well..
Lol.. Richa you got the expression so right. My daughter is exactly like you.. She can get out an expression on demand. When I tell her to be ‘natural’ she’ll tickle herself and try to smile naturally!! That picture of your parents is just so sweet. Haha imagine! Tickling yourself to get the pic right 😀 too good! You are lucky or not… some memories are best forgotten and if one can’t then one suffers. 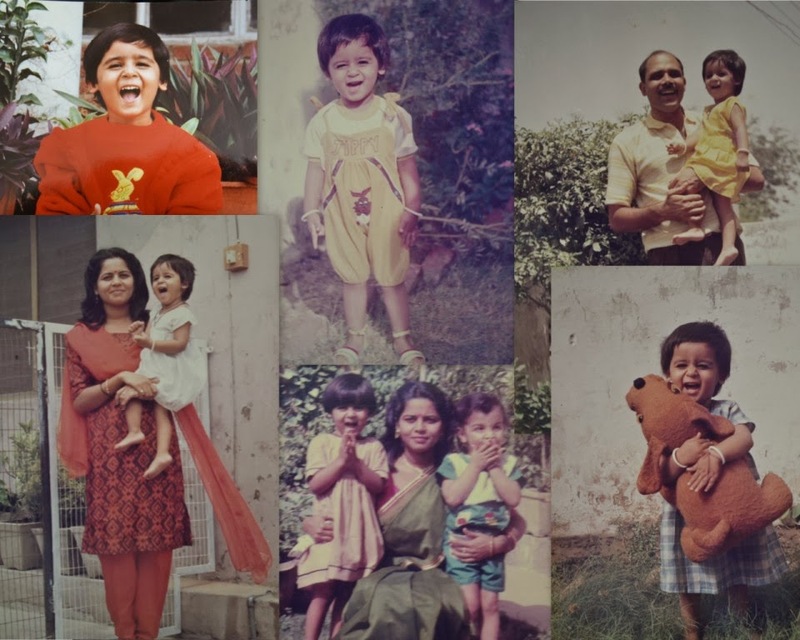 Love your childhood pictures and the aah wala expression 🙂 Parents are our strengths and lovely to see yours, great post. Lovely photos. Thanks for sharing them. Your passion for writing and life spills the cup and this reflects on your blog. you collage of memories stands a testimony that you have make the best of everything.Keep writing. Swetie, you are a copy of your mommy… hugs! You are almost like your mother. Touchwood…so pretty like you.